Dr. Vela Ostofvold is a forensic librarian, a Sherlock Holmes of the book world. She interprets the accumulation of ephemera, inscriptions, and notations. Each reader contributes to a secondary story independent from the authors’ text. In public Vela is often mistaken for her famous mother Olivia, a prominent opera star. Her father's identity is a mystery. On a visit to her mother’s apartment in Rome, Vela and her best friend and fellow book enthusiast, Amelia, discover a suitcase jammed under the bed. It contains memorabilia of Olivia’s career and the influence of her first voice coach Miss Penelope Arthur. Vela is captivated by a bundle of letters written by Miss Arthur during her assignment as a governess in India. Interwoven in the exotic travelogue of Maharajas and fire dancers in the desert, Vela finds clues to solving her paternity. 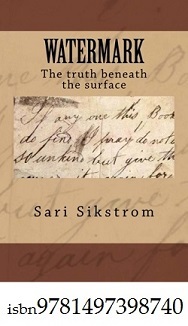 Watermark the truth beneath the surface is a poignant tale of past loves, missed opportunities and true devotion.